Over the years the boys have gathered together quite a collection of Nerf guns. The collection started with a single-shot Nerf gun and has developed into an armory of a few Nerf guns for each boy (from birthdays, Christmases, and allowance contributions). 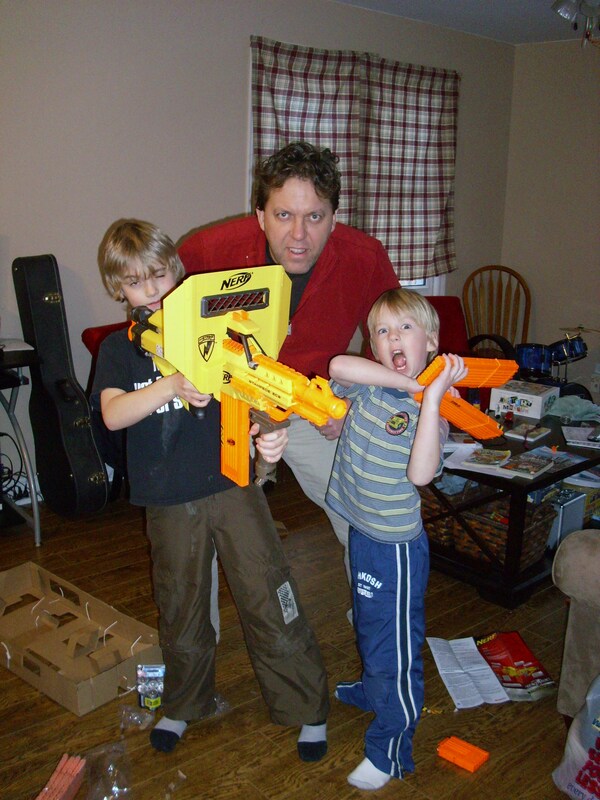 The latest purchase was a Nerf Stampede and there is a cool story to share behind that purchase. Elijah made a little cash at the Medical School over the Christmas holidays. Medical students ask a few children to come in and practice running through an appointment with them. Elijah loves to do this every year and makes about $80 for a morning’s worth of “work”! This year he said he wanted to buy something for his big brother with the money he made. He said he wanted to buy him a Nerf Stampede. Josiah has wanted one of these for a while. So we agreed that this was a good way to use the money, if he was sure about the purchase. He said he was sure. We took him to the store and discovered the Stampede was on sale that week – on for $40 down from $60. AND it came with 100 extra darts – SCORE! The purchase was made. Josiah said thank you and wasn’t sure how to handle such generosity from his little brother at first. After Josiah opened up the Stampede and Elijah saw how cool it was, he promptly asked if he could have a turn. This continued for the rest of the day, and Josiah suggested that maybe Elijah should buy his own stampede, or Josiah could give Elijah the money back that he spent on the Stampede. The situation was escalating over the prized possession until finally we came up with a solution that would keep the lesson of generosity intact and allow both boys to experience the feeling of being on the giving and receiving side of said generosity. Our idea was this – Josiah now purchase a Stampede for Elijah, but only if he was sure in his heart that he wanted to do this. After mulling it over for a while, Josiah agreed that was a good idea and would solve a lot of the issues the boys were facing. So a couple of days later we were off to the store again. I just smiled in amazement when we came to the Nerf aisle and saw that the Stampede was now on for $20. This is an amazing price for a big Nerf gun! From previous experience, I remembered that this store honours sale prices on items recently purchased, so we would get back $20 of the $40 Elijah had just spent on the Stampede. My heart was happy. I knew this would be an awesome lesson for the boys in how God honours our generosity and how more often than not, the giver is blessed just as much, if not more, than the receiver. I whispered a “Thank You God” and we proceeded to the checkout. Later on as we gathered as a family, I shared with the boys about how I saw God in all this business of Stampede giving and receiving the past few days. I shared with them that Elijah’s desire to bless his big brother was wonderful, that Josiah’s desire to honour his brother’s gift even when it was causing issues was noble, that giving on top of giving (Josiah buying a Stampede for his brother) was the best response, that I could see God at work in all of it, and that once again I was amazed that God can use anything to speak to us and show us something of himself – even Nerf guns. Previous What Was So Good About Good Friday? So is Elijah the magazine-chucking ninja in this picture?